Hey guys! It's Leigh from The Applicious Teacher! I am super excited to be blogging at Corkboard Connections today. I'm sharing a practice that I use to help increase my students' engagement and number sense during my math block. Do you play games in your classroom? Wait... what?! No time? Well... you should make time! Especially during your math time. To me, math and games go together like Nutella and pretzels. Delicious separate, but amazing together. As a third grade teacher, I know how limited our time can be, so I am here to share with you 5 math games you should take the time to play this year! All of these games are fun, easy, and require little to no prep. They are math games that I've played for years with my second graders. When I moved up to third, I was able to easily modify these games for my new "big kids". This game can be played in a k-5 classroom. It is perfect for building number sense and it's only prerequisite is that students can count. There's no supplies needed to play and my kids loved playing this as a "brain-break" before math. Here's how to play... Have your class stand in a circle. Moving in a clockwise direction, have the students count out loud until they get to a hundred. The person who says, "100" sits down. The last person standing, WINS! The idea is simple, but can be modified for your students. In second grade we'd count by 5's,10's, and 25's (to help with money later on in the year). For third, we count the multiples of numbers. For numbers that don't have a multiple of 100, I choose the last number in the sequence of 12 as the "end number." 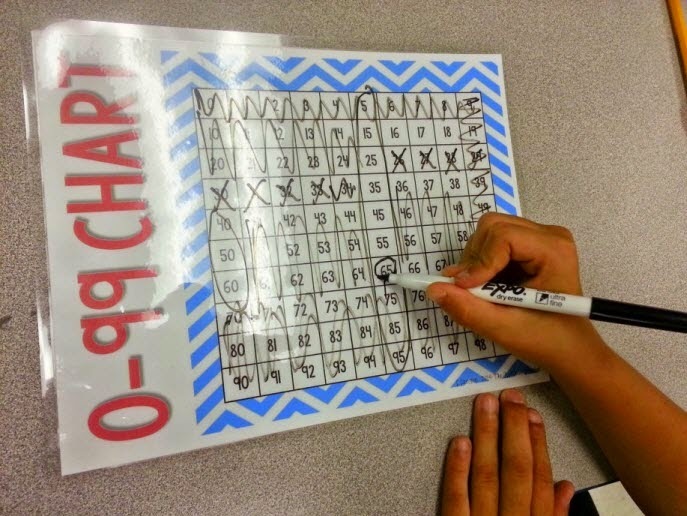 This paper and pencil game works well in second to fifth grade classrooms and can be played by teams of students (like boys against girls) or in pairs. To play you will need a sheet of paper, a pencil, and one dice. The object of the game is to score as close to 101 without going over or "out." I love how the kids start to form a strategy for what numbers they want to roll next. It's a great way to build mental math strategies. To introduce this game, I usually play it as, "The Teacher vs. The Class". This allows time for modeling while keeping the kids in on the action. What class doesn't love beating the teacher? They always want to play again if I win the round. Seriously, hands down, my class' favorite game to play! This game is perfect for inside recess as the whole class can play at once and everyone is excited for the game. This game requires some "brain sweat", so it works well for grades 2-5. There are two different versions of this game. Supplies needed are minimal: a writing surface, writing utensils, and someone who is quick with their math facts for a "caller." The object of the game is to guess the other player's number before they guess yours. To play, two students come up to the board and stand back to back (hence the name). This allows for the students to write on the board, but blocks their view of the other person's number. The "Caller" states, "Numbers Up". This signals the two students write a number of their choice on the board. I usually play with numbers 2-9 to keep kiddos from dwelling in the 0's and 1's easy train, but you can play with numbers as high or as low as needed for your group of kids. The caller then states the sum (for younger students) or product (3rd-5th) of the two numbers. The students use their understanding of math facts to figure out what they other person's number is when added or multiplied by their number. The player to say the other person's number first wins the round. The "loser" gets to choose the next person to come to the board. Please be warned... this game can get a little rowdy as students win and lose rounds and somehow the teacher always gets pulled up to "clear out" a player who's been up a little too long... But it's a lot of fun and well worth the 10-20 minutes! Beats the repetitious practice drills of flashcards! 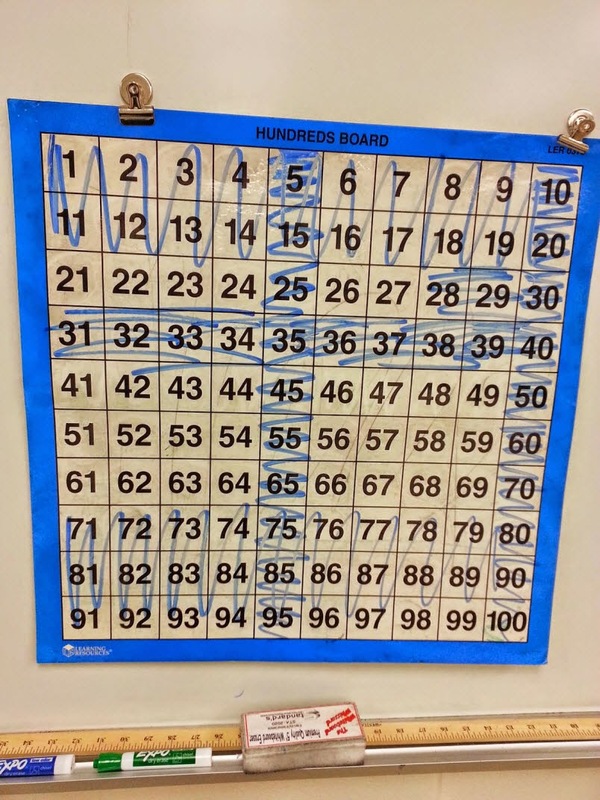 To begin, one student chooses a number. The other players try to guess the number by asking a series of questions. The student crosses off numbers it can't be and circles numbers it could. The person who guesses the right number, wins and gets to choose the next number. For third grade, I encourage the use of question clues like "Is it a multiple of 5? Or greater than 70?" 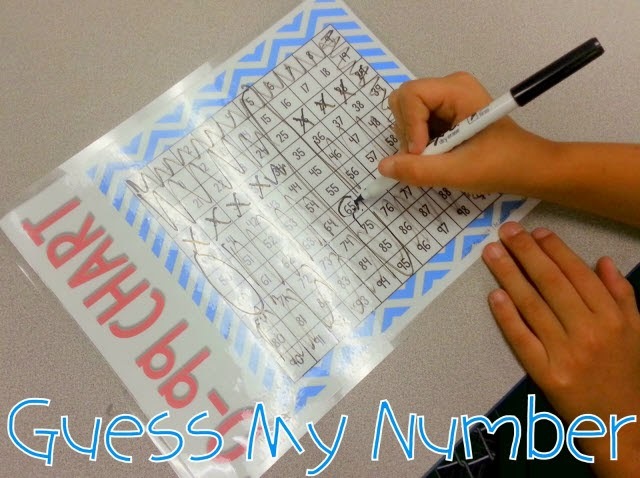 To introduce the game, I usually model crossing out numbers as students ask questions about the numbers and help link the clues to finding the right number. For a kindergarten or first grade classroom, you may want to play with a number line with numbers 1-20. Then, students could ask if the number is bigger or smaller than numbers within that range. A 4th or 5th grade classroom can beef up the game with question clues like, "Is it divisible by 3?" or "Is it a multiple of 5?" The possibilities are endless! Time range to play can be from 5 minutes to 20 minutes and can be used as an inside recess game or a quick brain break before or after a lesson. This last game works well in 1st through 5th grade classrooms and is best played in groups of 2-4 students. All that is needed to play are math fact flash cards. You can use addition, subtraction, multiplication or division cards. It just depends on where your students are in their math skills. I like to think of this game as "War for the Classroom," as the rules for the traditional card game apply to this math fact version. So go forth and play! Get your students engaged and learning in the new year! If you're not sure you'll remember all these games I shared today, I've compiled all the directions in one file for you. It's available here at my TpT store! Leigh is a wife, mother, and a second-grade- turned-third-grade teacher. She currently resides in Central Florida where she has been teaching for 7 years. When Leigh isn't teaching or writing for her teacher blog, The Applicious Teacher, she enjoys snuggling up with a good book, running a few miles, or spending time with her family. Back 2 Back is a game I have never tried. Thanks for sharing these games! Another way to play, which my kids love, is to use a deck of cards. Same idea - 2 players and a caller - each player holds their card to their forehead so that they can't see it but the other player and caller can. The first one to work out their number is the winner. Kuddos and thumbs up to Back To Back. We play this with a twist! Thanks for sharing! thank you. I teach adult esl and I always need things to practice numbers in english without it looking like we are practicing numbers in english. These will all work perfectly for that! Love all these games! Great ways to work on fluency and flexible thinking! 101 and Out is a game from Marilyn Burns. She has many more fabulous resources that require nothing more than a deck of cards! Love these ideas! I play a similar version of most of the ones you've mentioned. It is so important to take the time to let kids have fun in math class! Thanks so much for the reminder to play to learn! I've played all of these at one time or another, but LOVE having someone remind me to do it again! We especially love Back to Back and use it with all sorts of review for subjects! These are good ideas. I played one with my trigonometry class on Fridays, which was tic-tac-toe. I got the idea when I was student teaching from my supervising teacher. I varied it depending on what part of trig we were going, sometimes I'd ask for the sin of the angle, sometimes the cosine, sometimes just the radian measure of the angle. They loved it and Fridays were shorter class periods so it was hard to "teach" a whole lesson. Thanks for sharing these great ideas! I can't wait to share them with my students and I think that they will be a great addition to our math workshop! I shared your blogpost on my Facebook page. Thanks again! and I shared your article on my blog, are you oke? I'm a huge fan of teaching with games, and these are some of the best ... low-prep and high-engagement! Thanks for sharing, Leigh! Thanks for some great ideas! After 17 years of teaching, it's not often I find math game ideas that I actually haven't tried before! Thank you for these games. Makes me realize how dull my lessons have been. These should make it more fun while still working on needed skills. These are fantastic and fun games. I appreciate that they require little prep. Thank you so much for sharing! Trying out Back to Back tomorrow! I think my kids will love this! These games are especially designed for kids. 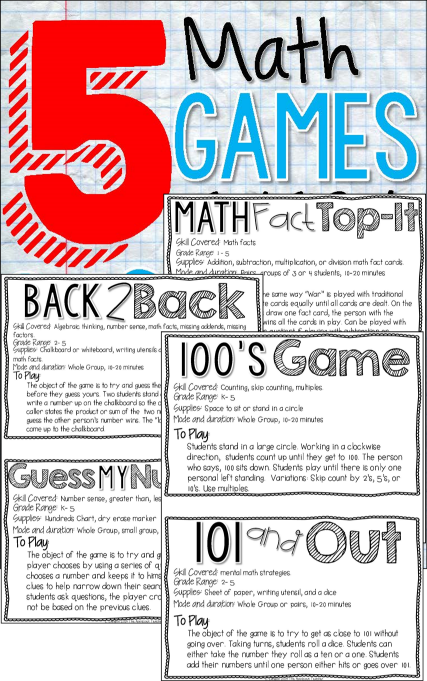 Teachers should Suggest these games to kids and yes these are the must haves for classes. This is certainly been so important. Great games with little or no materials! Perfect for a Teacher on Call! Thanks! I will be adding these games to my back pocket! Great games that require little or no materials. Perfect for a teacher on call! I will be adding these games to my back pocket! Thanks! Penguin Fractions = Fraction Fun!